Paddling at speed up the Liffey in a dragon-boat with 21 other women, all of us with our eyes closed while a helmswoman calls the beat was not something I’d ever planned on doing. I spent last night with the Plurabelle Paddlers – a group of women who race dragon-boats around Ireland. And while sunset on the river might conjure up some relaxing images, there was no hanging about with this group. Chairperson Fiona Tiernan told me their coach plans on videoing the next session so she can “scrutinize” their strokes. I’m not quite sure if she was joking. Getting the boats into the water was exercise in itself – wooden and heavy, lifting them out of the sheds and down into the water meant a lot of “mind your fingers” and “no, no, you’re other left”. The long boats are similar to stretched kayaks with wooden seating for up to 50 rowers at a time depending on the size of the boat. And they have drums. Yup, drums. Sadly of the two boats out last night, I was in the drum-less boat but hearing the other run thump its up way up the river as the wooden oars flashed in and out of the water in time more than made up for it. The closed eyes? Helps with your timing apparently, also with skinned knuckles and clashing oars. And as we flashed – ahem, I use that word rather loosely – past the bars on the Grand Canal Dock, I wondered did those people know what they were looking at? We paddled in a pink boat, many of the regular crew were wearing pink fleeces or headbands and a HSE sticker decorated both boats. Pink, pink to make the boys wink. But it’s also the universal Breast Cancer colour. Many of these women were recovering from treatment, but you had to look closely to notice. There was just a quick flash of intensity to queries about someone’s health as we readied the boats, but that disappeared when it was time to get in the water. Sit up straight at the edge of your seat, brace your feet for the kick … Ready? Attention! Go! 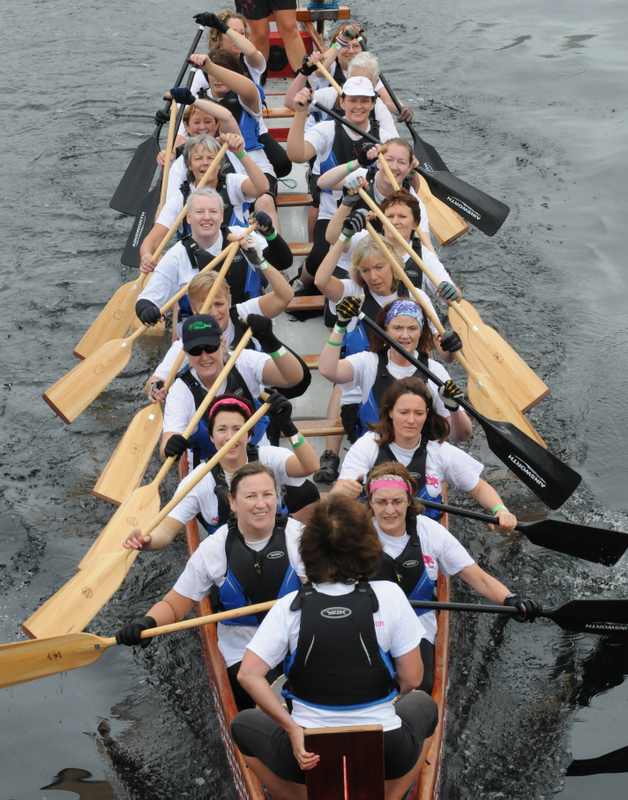 The PlurabellePaddlers is the first dragon boat team in Ireland. The team was set up by Fiona Tiernan, in order to keep fit after a recurrence of breast cancer. From a membership of two and no boat in 2010, we now have 60+ active members, a wonderful coach Julie Doyle and two dragon boats.